What are a multifocal lenses? Multifocal lenses (also known as progressives) are tailor-made lenses, which combine multiple optical powers in the one lens, without any visible line. 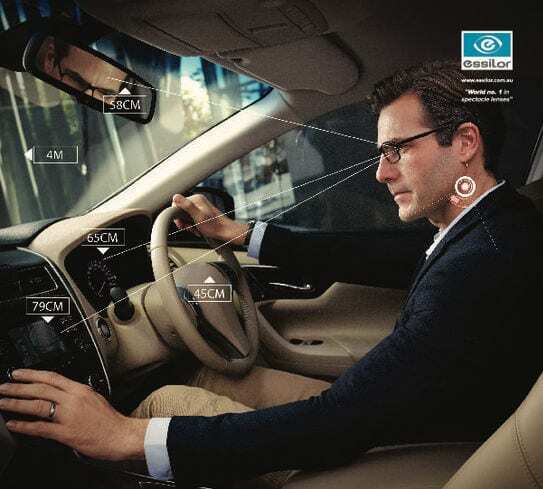 These lenses allow you to see the largest range of distance, from reading close-up all the way to looking far ahead needed when driving or when you’re out and about. The bottom portion is for close reading (near). Who can wear glasses with multifocal lenses? After testing your eyes, our optometrists will be able to recommend the best lens to suit your lifestyle. Generally, patients in their 40s or older will likely notice that their reading vision begins to deteriorate due to age (presbyopia). They often find it frustrating to be taking their reading glasses on and off all day. In such cases, multifocal lenses are an excellent solution. We can also use multifocal lenses to try to reduce the chance of progression of short-sightedness (myopia) in young children. How is a multifocal lens different from a bifocal lens? A bifocal lens has only two optical powers, usually for distance viewing and close reading, which are separated by a visible line. These lenses do not incorporate any prescription for intermediate or computer vision. How do you use your glasses with multifocal lenses? We recommend you point your nose at the object/reading material you wish to view, then slowing nod your head up and down to find the portion of the lens that is clear. If you move your head left and right you will notice distortions/blur, so when reading, you will need to move your head slightly as you move along the page from left to right. What are the advantages of wearing multifocal lenses? In a word, convenience! Most people find the idea of one pair of spectacles – allowing you to see at both close and far distances – very convenient. This means you no longer have to take your reading glasses on and off, or swap between glasses, which can drive people crazy at times. These lenses are ideal for when you’re out and about e.g. grocery shopping, lecturing, socialising. What are the disadvantages of wearing multifocal lenses? Multifocal lenses have peripheral distortions, with the middle corridor of the lens being the sharpest. Quite often, people find these lenses suboptimal for lengthy computer work and prefer to wear designated computer lenses such as occupational lenses. How long does it usually take to adapt to multifocal lenses? This varies between patients. We often see patients who are comfortable from day one. However, others may take a few weeks to settle in. Be sure to let us know if you are having difficulty adapting so that we can give you some extra tips and make sure your frame is adjusted perfectly to fit your face.